A few weeks ago, a good friend (and fellow beer writer) of mine, Nik, came to visit me in San Francisco. He’d never been to the city before, and wanted to check out as many breweries as we could fit in during his stay. The Bay area is home to a ton of amazing spots, ranging from epic beer bars and new craft breweries, to old favorites such as Anchor and Lagunitas. I’d done a bunch of stops with friends who were visiting for a week, but 48 hours posed an interesting challenge. Could we actually make it to the highlights in that time? What are the highlights if you only have two days? After talking it through a ton, and shuffling and reshuffling our agenda, below is an account of what we ended up doing, which I think we both agree was a pretty solid lineup, and something you can definitely do yourself if you travel to the area. While I’d probably recommend coming for much longer, this plan got it done, and was a blast. Nik arrived around 11pm, so we didn’t have a ton of time to travel around. Given the timing of his arrival, and the wonderful weather we were having at the time, we made our first stop at Zeitgeist, an old-school beer garden in my neighborhood, the Mission. Zeitgeist is one of the best beer bars in San Francisco, and is a spot you should definitely check out, especially when the weather’s nice. The majority of the bar is outside (bring a jacket if you’re sticking around after sunset), and seating is traditional beer-garden style, with large communal picnic tables. The bar is cash-only, but there’s an ATM inside if you forget to bring some with you. Brews range from pale ales and IPAs to some amazing sours. If you get hungry while you’re there, you can also score a burger or a grilled cheese (my personal fave) for just a few bucks. What to Drink: Zeitgeist has a great mix of both local and national breweries. 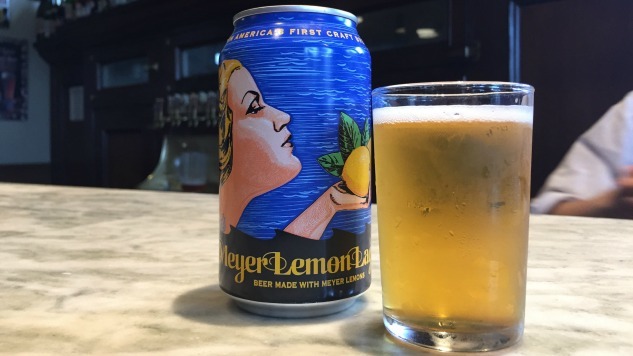 Local brews are labeled on the menu, and if they’ve made it on draft at Zeitgeist, consider them to all have already been vetted and well worth ordering. We made day two our day to travel north, specifically because it was a Thursday (a lower traffic day than Friday, our other option). Russian River, about an hour drive from SF, was our first (and arguably most important) stop, and the brewery is exceptionally popular after work and on weekends. If you’re traveling to the area and have the opportunity to make the trip on a weekday, DO IT. To put things in perspective, a few weeks earlier I went with a few friends on a Saturday. We waited roughly two hours outside before we could get into the bar, and another 30-45 minutes once we were inside to get a table for lunch. When Nik and I arrived at roughly the same time (around noon-1pm) on a Thursday, we were able to walk right in and instantly get a table. The taproom opens at 11am, and the closer you can arrive to that time, the better off you’ll likely be. Also, plan on having lunch here. Trust me. What to Drink: Grab yourself a Pliny (one of the best double IPAs in the world) from the source. Also be sure to try one (or a few) of Russian River’s sours. Maximize your tasting by trying a few off the board that aren’t bottled, and pick up a few bottles in the gift shop to take home with you. Avoid the taster. It’s WAY too much beer to handle if you plan on driving and/or trying other beers later. Kunde Estate is located in the middle of wine country, so if you’re a wine fan, consider hitting a few different wineries during your visit. We were on a tight schedule, so we opted to hit just one: Kunde Estates. I like Kunde because I sold its wine forever ago at a wine store I worked at in North Carolina right after I graduated college. As wineries go, the property is beautiful. There are mountain top and cave tasting opportunities, as well as a tasting room where you can just do a flight of some of the wines they have available. A tasting runs $15, and includes a sampling of a large amount of its portfolio. Lagunitas is in Petaluma, and makes for a great stop on your way back into the city. The outdoor beer garden offers a mixture of pub fare and pizzas, and the bar has a ton of brews on tap that you won’t find anywhere else. If you happen to come on a Thursday like we did, you can catch a special beer on tap. Also important to note: Lagunitas is closed Mondays and Tuesdays, so plan accordingly if you want to check it out. We had originally planned to do quite a bit in the evening after we got back from Russian River and Lagunitas, but a power nap before going out again turned into a home-based beer instead. That directly effected our Day 3 itinerary, which originally contained some Berkeley spots, but now the plan shifted to a whirlwind trip through San Francisco, hitting a few stops we’d planned on visiting the night before. We had a “one and done” approach to the day, which made it possible to every place on the list, and we weren’t wasted at then end of the day. If you can, you might want to throw one or two of these on your Day 2 itinerary so you have more time at each stop. We started the day at Anchor primarily because it was the only time we could score tour reservations. That said, the timing worked out great. Tours at Anchor are by reservation only, and run $20 a ticket. That $20 gets you roughly an hour-long tour of the facility and then tastes of all of Anchor’s brews afterwards. Before they charged, this tour would fill up months in advance. It’s a little easier to make a reservation now that there’s money involved, but tours do still fill up pretty quick. If you know you want to come here, go ahead and make that reservation early. Hit up 21st Amendment for lunch. The bar has outstanding burgers, and most of 21st’s brews on draft. If you’re a Hell or High Watermelon fan, grab yourself a pint of the brew here, where it comes with a watermelon slice garnish. A replica of Mikkeller’s location in Copenhagen, this bar has quickly turned itself into a must-stop for beer lovers in the city. Grab a pint or two of Mikkeller’s pub-specific brews only available at this location, or try one of the other often hard-to-find beers on draft. This is one location I highly recommend visiting during daytime hours or with an entourage. It’s located in a somewhat rough neighborhood, and isn’t exactly somewhere you’d want to wander around alone at night. That said, use something like Uber of Lyft to get in and out of the neighborhood or travel with a friend or two and you’ll be fine. If you’re thinking of grabbing some beer to take home with you, then this is your spot. City Beer Store is part bottle shop, part bar. There are always quite a few outstanding brews on draft, and one of the best bottle selections in the city. A good number of the bottles for sale are in coolers, so they’re cold, and can be consumed on-site for a small corkage fee. Around the corner from City Beer is Cellarmaker, a tiny taproom with some fantastic beers on draft. If you can, try to get here before the post-work crowd starts to trickle in. The space is fairly small, and it will quickly become standing room only once 5 o’clock rolls around.